If there’s one thing that I can’t resist its a rose, her beauty and her perfume. This week saw the last of the rose blooms in the garden, and the scent of black beauty just had to be brought inside to perfume the whole house for the last time before Spring blooms again. Hope you have some special time on the weekend, some leisure time to walk around your garden, and maybe smell the roses. Lovely teacup too. Enjoy your weekend. Yvette, I too, love roses…and their scent is heavenly to be sure. I just bought a bouquet on sale, and the fragrance permeated my senses. 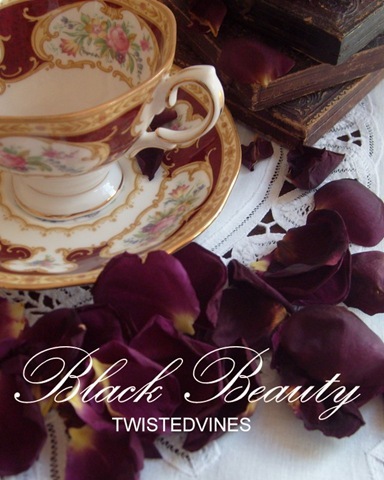 Your roses truly earn their name giving off such a deep vibrant hue, which so perfectly matches your exquisite teacup. Now I’m off to continue reading about those delectable choc. custard cream cones! I, too, have a sweet tooth, and these look yummy-licous!! Such beautiful, stunning photos! Plus I am stunned because I have some cups exactly like that. My husband received them from his sister and they had belonged to his grandmother. 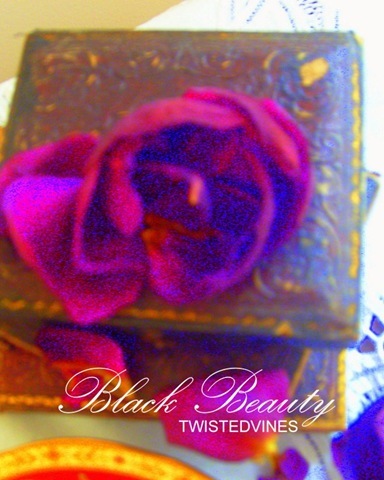 To my knowledge I have never seen nor smelled a black beauty rose, but I KNOW that I would love it! Thanks for brightening my day! 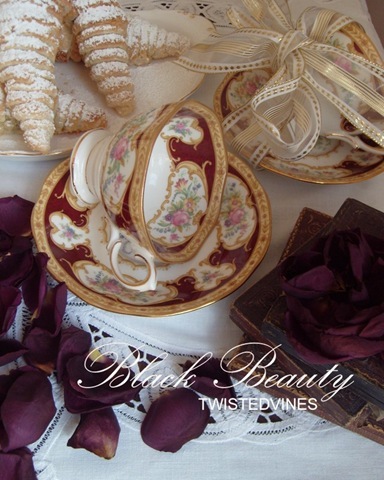 What a lovely teacup and saucer…..I am another rose lover and have them around me all year…it is a weakness! So nice to meet you and your beautiful blog! Thanks Jil, roses are soooo my weakness, I’ve over two hundred in my garden..
Hi Yvette! Thanks so much for stopping by my blog recently. I always love to meet new bloggy friends. 🙂 Your blog is beautiful. I absolutely adore your photos, and I’m excited to see recipes, too. Definitely going to be doing a ton more browsing here. Oh I absolutely adore those cups. I love your table arrangements and how you put together these beautiful palettes.